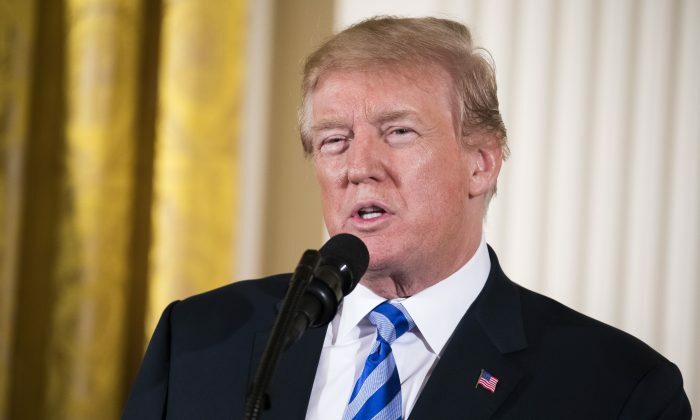 President Donald Trump on Thursday vowed to push for comprehensive background checks, with an emphasis on mental health, for gun purchases. The President also said he would be in favor of raising the minimum age for buying certain guns to 21, and expressed hope Congress would act on the issue. “I will be strongly pushing Comprehensive Background Checks with an emphasis on Mental Health. Raise the age to 21 and end sale of Bump Stocks! Congress is in a mood to finally do something on this issue – I hope!,” Trump wrote on Twitter on Feb. 22. Earlier this week, Trump instructed Attorney General Jeff Sessions to craft regulations banning so-called bump stocks, which effectively add a rapid fire function to semi-automatic rifles. According to a number of media reports, Trump is considering raising the age to purchase certain types of weapons to 21. Citing an unnamed White House Source, Axios reported that the rise in minimum age would apply to semi-automatic weapons, such as those used in the shooting at a high school in Parkland, Florida, last week. Seventeen people were killed at the high school when a gunman opened fire on students and teachers. On Wednesday, Trump held a listening session with high school students and teachers on guns at the White House. Trump also used Twitter to come to the defense of the National Rifle Association, which has been criticized by some following the Parkland shooting. “What many people don’t understand, or don’t want to understand, is that Wayne, Chris and the folks who work so hard at the @NRA are Great People and Great American Patriots. They love our Country and will do the right thing,” Trump wrote on Twitter on Feb. 22.